I had to order this book from Barnes & Noble after reading references to it in many books on culture and postmodernism. 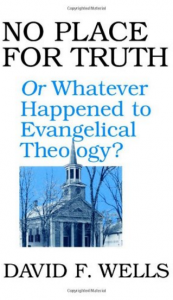 It is a 1993 book by Wells (theology professor at Gordon-Conwell) subtitled “Or Whatever Happened To Evangelical Theology?” Through historical perspective Wells displays the breakdown of interest in theology as truth. Today we talk in broad-brushed language about salvation or the Bible, language that allows us to invite the widest possible acceptance. It is also an incisive indictment on the view that culture is neutral. In fact, that view is seen to be one of the most poignant fallacies of our day. From television and theater especially, to pulpits and living rooms, America has shaped its people into group stereotypes, most of which have no place for truth. Wells is very interesting.